Today we are looking at a super-fun Fender Champion 600 guitar amplifier. This is a re-issue of the original amplifiers that were built between 1949 and 1953. 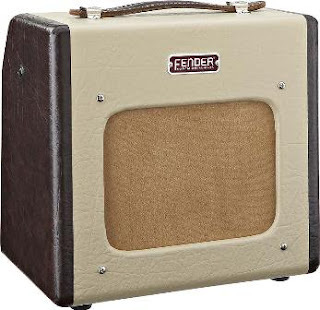 This is a pretty faithful reproduction of the original, although Fender said they have added a higher-gain pre-amp circuit to get more overdrive. I have never seen (let alone played) an original, so I will have to go along with them on this one. The Champion 600 is a neat amplifier, and very light weight. It weighs in at around 15 pounds, and measures about 12 inches wide by 11 inches high by 8 inches deep. The 50s groove is going ON with the two-tone Tolex. The electronics are 1950s simple too. This is an all-tube amp, with a 12AX7 pre-amp tube and a 6V6 output tube. The output is pretty low, putting out 5 watts at 4 ohms through the built-in 6-inch speaker. You can hook up a larger external speaker, should you wish. The controls are dead simple: 2 inputs (high and low gain), and a volume control. That is it -- you will have to do all of your EQ with the guitar or your pedal board. It is a simple machine, and there is no much more to describe, other than the tone. This amp sounds great! It does not hiss or hum excessively, and it puts out enough volume for home practice or recording. It overdrives fairly quickly, which is great if you want some old-style blues or rock and roll at reasonable volume levels. Looking this one over, I would have to say the craftsmanship is pretty good. The Tolex is even, and the electronics are tidy. And, yes, these are built in China, so they do not have any “Fullerton” magic, but that does make them more affordable. Of course, it does not hurt that the Champion 600 is very affordable. The list price on these is $199.99 with a street price of $149.99. And, it looks like you can find used ones for about $100 on Craigslist.